Welcome to the website of the Downtown New York City Branch of Shorinji Kempo. Shorinji Kempo (少林寺拳法) is a martial art in New York City that seeks to create harmony between the principles of strength and love. It is an authentic Japanese martial art that embraces its origin and long history in Japan, as well as its influences from traditional Chinese martial arts sects. The disciplined study of our unique hard and soft mixed martial arts techniques gives students the power of self defense, improved physical condition, and a balanced spirit in all areas of life. Our approximately 600 technical variations, practiced through four training methods, were designed so that anyone, regardless of physical stature or muscular strength, will be able to realistically put them to use in difficult real-life situations. These techniques were created by the founder of Shorinji Kempo, Doshin So. Shorinji Kempo was founded in 1947 and is now taught and practiced in over 30 countries. 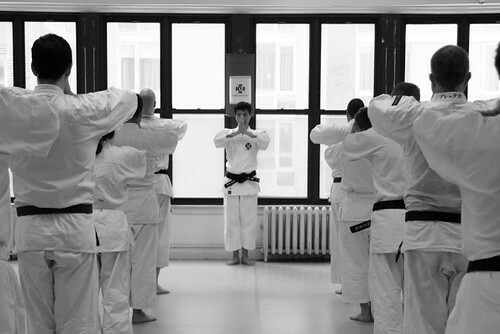 Shorinji Kempo Downtown New York Branch is located in the East Village (formerly named the New York City Branch, established in 1982). Grading examinations (for green, brown, and black belts) are taken under the authority of the United States Shorinji Kempo Federation (USSKF) and the World Shorinji Kempo Organization (WSKO). We are a non-profit and non-commercial organization. Our purely humanistic philosophy is to contribute toward a peaceful society with the strength of our minds and actions. Happy spring! For the month of April, we will have regular class times on Wednesdays and Saturdays. This year marked the 15th year of our participation in the United Nations International School's annual Japanese Spring Festival. In a recent video from our Facebook page, two kenshi practice punching with a safe and effective method. We enjoyed our annual new year's party this year in Brooklyn. New students can take advantage of a special Groupon offer for one or two months of classes, up to 62% off. Please visit our blog for reports on our latest events.